Your coach may require every member of the team to purchase the identical youth practice football jersey, or he may tell you to simply buy a practice jersey in a specified color. In some cases, he may split the team up, requiring one half to buy one color and the other half to purchase a different color for the purpose of practice game scrimmages. If your coach requires the players to wear identical practice jerseys, he should have already arranged for a specified sporting goods store to have those jerseys on hand for purchase. Why should players wear specific practice jerseys if they are simply worn at practice? Many coaches subscribe to the theory that organization and unity begins on the football field, and those players who look like a team will act like a team. 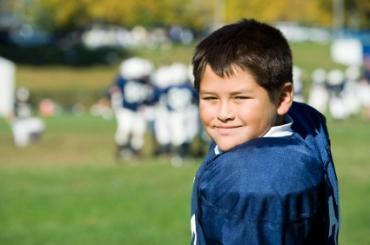 Even if your coach specifies a particular jersey, you'll still have some decisions to make when choosing a practice football jersey for your child. Fit: Don't just assume you know what size your child will wear. The best way to get the perfect fit is to let your child try on the jersey while wearing his football pads. While you don't want the jersey to be too tight, you also don't want a lot of extra material either. Once your child puts on his pads, have him try on each jersey size that might seem appropriate. He should raise his arms up and down and side to side to make sure his range of motion is not impeded. Size: Another point to keep in mind is how sizing works for jerseys. Since you'll need a jersey that will accommodate the pads comfortably, you may not need to purchase a size that is similar to your son's shirt size. For example, many youth XL jerseys are actually almost identical in size to an adult small. If you can't find an XL jersey, then consider purchasing an adult small in the same style instead. Keep in mind that this doesn't always hold true, however, so if you are ordering online, pay close attention to any available sizing charts. Durability: Most coaches prefer their players to purchase mesh practice jerseys. If this is the case for your child and you have some leeway over where to purchase his practice uniform, be sure you choose a jersey that is durable. Heavyweight polyester is typically the material of choice, and look for a porthole mesh design as well. Keep in mind that the jersey you choose may serve a dual purpose. Once football season is over, you child can still wear the jersey on a day to day basis or even as pajamas. Finally, in most cases you'll need to purchase a new practice jersey for your child. Used jerseys may be hard to find, and even if you do find one, it may not be in the best shape. However, if you can choose your own jersey and you really want to save money, check out stores like Play It Again Sports that sell used sports equipment and accessories. You can also do a search of sites like eBay for bargains. Finally, there are numerous other sporting goods sites, such as Sports Depot and of course Hibbett Sporting Goods that carry a wide range of sporting equipment, accessories, and clothing.